My buddy Michael and I rode in the Summit to Surf bike ride on Saturday. The ride was absolutely remarkable. The American Diabetes Association did an amazing job organizing the ride, especially when it came time to supporting the riders. There are several distances you can choose from when you do Summit to Surf. 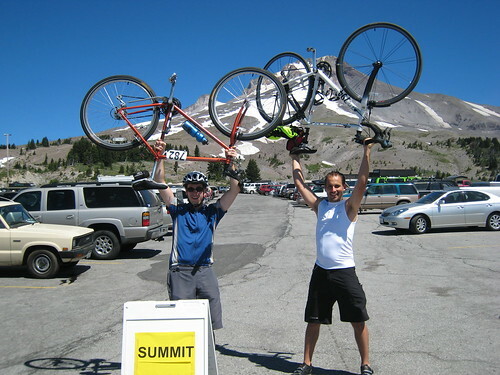 When Michael and I signed up for the ride, we were only planning to do the 56 mile leg from Welches to Hood River. However I was feeling adventerous on Saturday morning so I suggested to Michael that we do the Timberline climb, adding 12 additional miles and 1700 feet of additional vertical climb. We did the crazy climb and the views were simply amazing. When we finished the ride in Hood River, we feasted on Burgerville cheeseburgers and some fantastic Widmer beer. It was the perfect end to a perfect day. A while back I rode in Reach the Beach that took me up and over the Coastal Range. The ride on Saturday was roughly twice as far with almost twice the vertical climb as Reach the Beach. I’m stoked I was able to do *both* rides without ever walking my bike. Another cool thing: as a team, Michael and I raised $270 for Diabetes research to find a cure for this terrible disease!